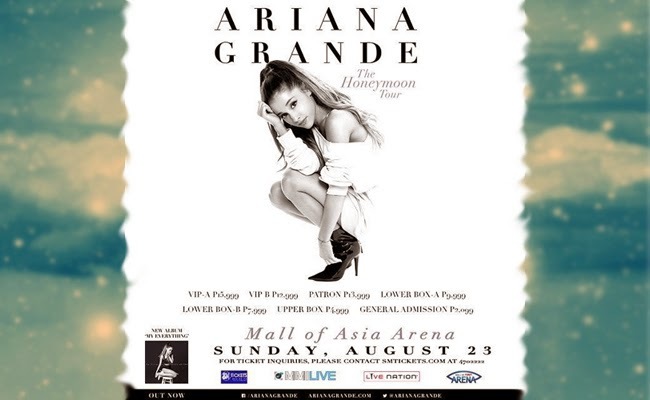 Fans of Ariana Grande in the Philippines were shocked to see the prices of the concert tickets for the upcoming concert ‘The Honeymoon Tour’ in the country. With the minimum ticket price of P2,099, it does not even include anything else but just the seat. It has no loot bag or even a meet and greet. After MMI Live, the concert organizer, made the announcement of the prices on Friday, fans could not contain their emotions, creating a hashtag to lower the prices of the tickets. The price P2,099 is only for general admission with nothing included while the highest price is for VIP A worth P15,999. Many fans say that they are just students and their parents won’t let then go to the concert with such steep prices. Many had also criticized the prices while a lot made fun of it to feel better. They say that they wanted to go to the concert but the chance had been taken away from them as many could not even afford the lower box. The tickets will be available on April 14, and the fans can still have a little more time to save up for their dream concert.